Part Four, “ Advancing Vision" introduces you to a Vision Integration Model that helps you deliver vision daily. What practical steps help visionary leaders go to the next level? How can leaders raise up and align more stakeholders in the congregation? What do you do with those preciously frustrating saints who are anchored to yesterday? Is there a model for a central vision that redeﬁnes how the various departments and staff people can work together? 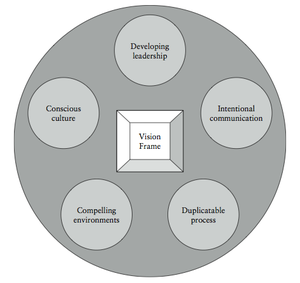 Behind the Vision Integration Model is perhaps one of the most important assumptions of the book: the success of advancing vision is directly proportional to the degree to which the vision is ﬁrst aligned and integrated. As we discuss vision as lifestyle, the ideas of church culture and vision integration are vital. In other words, nourishing internal culture must precede expanding outside inﬂuence. Real change is inside-out.